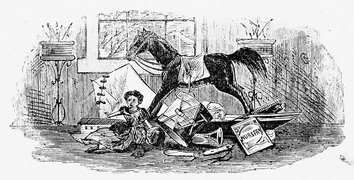 Drawing of a pile of toys including a rocking horse. This black and white toy image is copyright free and fully downloadable and would make a great addition to a project about children’s toys, a playroom or Christmas wishes. This vintage drawing was from an 1882 book, published by Hall and Whiting of Boston entitled Golden Rays.